July 11, 2017 – Marriott International Inc. (NASDAQ: MAR) today announced the debut of the FairfieldSM by Marriott® brand in Greater China with the opening of Fairfield by Marriott Nanning Nanhu Park, marking the first opening among more than 100 hotel signings slated for the next five years. Marriott International and Dossen International Group signed an exclusive development agreement to bring the Fairfield by Marriott brand to mainland China in September 2016. The partnership targets aggressive growth in different cities across China in the next five years. 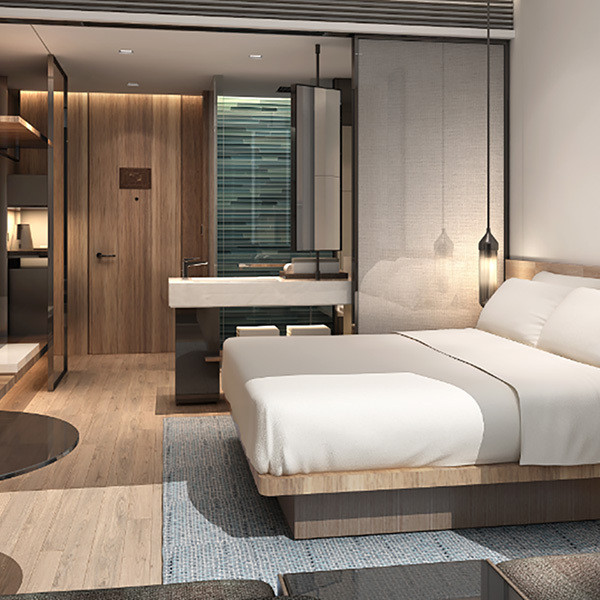 The introduction of the Fairfield brand is a significant milestone in Marriott International’s expansion in the Select Serve hotel segment in China, and is part of the company’s strategic plan to expand rapidly across a broad spectrum of price tiers and destinations across the country. Fairfield is a global leader in the Select Serve hotel segment with nearly 850 hotels in the United States, Canada, Mexico and India in its rapidly growing portfolio. Fairfield by Marriott has achieved rapid brand expansion as well as market penetration through its trusted business model by franchising to reliable business partners globally, and particularly in China through its partnership with Dossen International Group. Fairfield offers value-minded travelers who seek a seamless stress-free stay, allowing them to maintain balance in their routine and stay productive while on the road, all with the quality and consistency and service experience of an international brand. Fairfield’s Chinese name (wàn fēng) was inspired by the brand’s spirit of simplicity, dependability and comfort. Guests wake up to complimentary breakfast at the hotel’s restaurant with its abundant selection of healthy Western and Chinese specialties, and can purchase snacks and refreshments from a 24/7 market conveniently found in the lobby for easy meals on-the-go. What’s more, they don’t need to miss a beat of their workout routine with a 24/7 Fitness Centre onsite. Located at Binhu Road in the beautiful new Qingxiu District of Nanning City, the hotel is a short 10-minute walk from Wanda business district and Xianbin Lake park. It’s also within convenient access to the Nanning International Convention and Exhibition Center by public transportation, as well as an easy car ride to Nanning East Railway Station and 45 minutes by car to Nanning Wuwei International Airport. Its central business location will make it ideal for guests traveling for business or for pleasure. Fairfield Inn & Suites by Marriott is designed for today’s traveler who is looking to be productive on the road, whether for business or leisure. In addition to complimentary Wi-Fi and hot breakfast, Fairfield Inn & Suites offers thoughtfully designed rooms and suites that provide separate living, working and sleeping areas. With over 850 properties around the globe, Fairfield Inn & Suites is proud to participate in the industry’s award-winning loyalty program, Marriott Rewards® which includes The Ritz-Carlton Rewards®. Members can now link accounts with Starwood Preferred Guest® at members.marriott.com for instant elite status matching and unlimited points transfer. For more information or reservations, visit www.fairfieldinn.com, become a fan on Facebook or follow @FairfieldHotels on Twitter. Marriott International, Inc. (NASDAQ: MAR) is based in Bethesda, Maryland, USA, and encompasses a portfolio of more than 6,100 properties in 30 leading hotel brands spanning 124 countries and territories. Marriott operates and franchises hotels and licenses vacation ownership resorts all around the world. The company also operates award-winning loyalty programs: Marriott Rewards®, which includes The Ritz-Carlton Rewards®, and Starwood Preferred Guest®. For more information, please visit our website at www.marriott.com, and for the latest company news, visit www.marriottnewscenter.com. In addition, connect with us on Facebook and @MarriottIntl on Twitterand Instagram. Dossen International Group is China’s top 5 hotel groups. Dossen owns 8 hotel brands and 1 financial service brand. Since its establishment in 2006, Dossen has concentrated on corporate values: “Customer-oriented, Cooperation & Sharing, Passion & Focus, Result-oriented”. And aim to be one of the leading hotels groups in the world. For now , Dossen owns more than 1200 hotels in over 200 cities in China, Malaysia, Belarus, Burma and other countries, has more than 20,000 employees, over 15 million loyal members, over 3 million Wechat active members. Dossen serves almost 100,000 guests every day and over 40 million guests each year. For more information, visit http://www.dongchenghotels.com/.